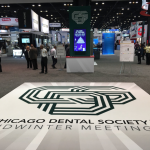 Each year, thousands of dentists descend upon the Windy City for the Chicago Midwinter Show—one of the biggest gatherings of dentists, hygienists and office managers of the year. Over time, this show has developed a reputation for being the event where new technology is introduced to dentists. And, this year, we had our own game-changing technology to unveil: Our new cloud-based practice management software, Fuse. For three days, we talked with dentists, office managers, dental students and other attendees in our booth about the benefits of cloud-based practice management software and showed them how Fuse could help them work smarter and more efficiently. This series of tweets helps tell the story of our whirlwind experience at this year’s Chicago Midwinter Show. We kicked off day one of the show full of excitement! We also introduced a new booth design at the Chicago Midwinter Show this year! And finally, one office manager from Dallas loved the Fuse “smart screens”, which allow you to view, filter, and act on real-time patient information–from more than one location. At the end of the day, we left the Chicago Midwinter Show wonderfully fulfilled about the potential game-changing impact Fuse will have in the years ahead for dentists. Learn more about Fuse, sign up for our Fuse e-newsletter, or get your very own demo here. What does this mean for the future of Eaglesoft? Thanks for the comment and question, Timothy. Fuse wasn’t created to be a replacement for Eaglesoft, which is still a great solution for practices looking for on-premise software. We fully intend to continue supporting Eaglesoft and investing in its development into the foreseeable future. So far no reply. This does not look good.